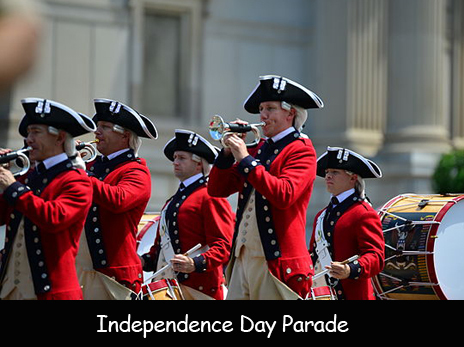 Independence Day in the United States of America is celebrated on July 4th. It is a celebration of the adoption of the Declaration of Independence in 1776. The first ever celebration of Independence took place on July 8th, 1777 in Bristol, Rhode Island and Philadelphia. The official signing took place on August 2nd, 1776. The Declaration of Independence started on July 2nd, 1776 and the final wording was approved on July 4th by the Continental Congress. It began with a letter to King George. This letter clearly explained why the Continental Congress voted to declare independence from Great Britain. All the American colonies were declared as free and independent states. The Declaration of Independence was signed by 56 people from 13 different colonies and the majority of it was written by Thomas Jefferson. It has five parts: the Preamble, the Statement of Human Rights, Charges Against Human Rights, Charges Against the King and Parliament, the Statement of Separation and Signatures. The meeting was held in Philadelphia at the Pennsylvania Statehouse. It is now known as Independence Hall. The White House celebrated the Independence Day in 1804 for the very first time. In 1880, July 4th was officially declared a holiday. Two of the Founding fathers of the nation, Thomas Jefferson and John Adams died on July 4th, 1826. According to a survey report, around 2.5 million people celebrated the first Independence Day. The 30th President Calvin Coolidge was born of July 4th, 1872. July 4th is also celebrated as Liberation Day in Rwanda and Republic Day in Philippines. Thomas Jefferson first held an Independence Day celebration at the White House. Declan, Tobin. " Fun Facts for Kids about Independence Day ." Easy Science for Kids, Apr 2019. Web. 20 Apr 2019. < https://easyscienceforkids.com/independence-day/ >.